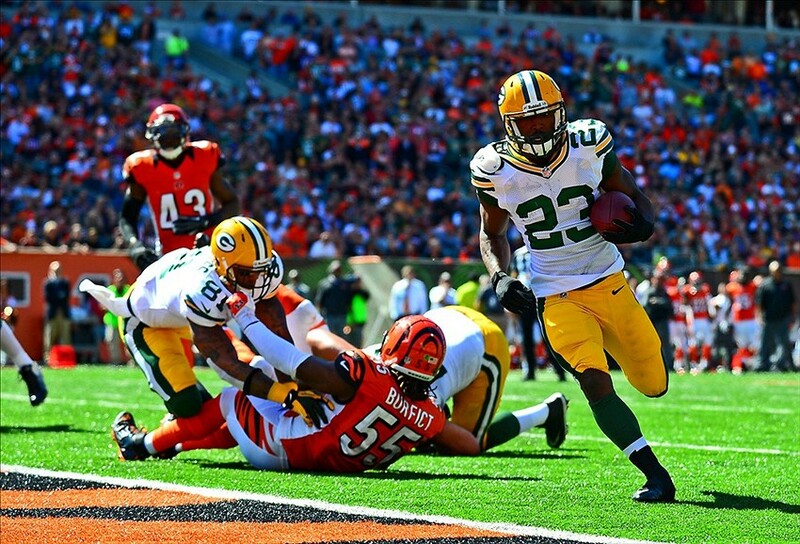 ~Titletown, USA – When it comes to speaking Mike McCarthy’s language, I consider myself fluent. Having routinely chatted with Green Bay’s head man on SiriusXM Radio since he took over the Packers in 2006, I feel pretty comfortable assessing his tone and reading between the lines. When I talked to McCarthy on “Schein on Sports” last Thursday, the 10th-year head coach was in a good mood. And why wouldn’t he be? With a successful minicamp winding down, it was crystal clear McCarthy loves the talent and the character of the 2015 Packers. And McCarthy is not one to be subject to hyperbole. Far from it. Which leads me to make the following declaration: This year’s offense will be, quite simply, the best that we’ve seen during McCarthy’s prolific decade in Green Bay. And I’m not exaggerating, either. I firmly believe this. I had this feeling before talking to the coach. Now? I’m fully convinced. I truly felt McCarthy’s enthusiasm for the group during our live interview. Listening back to the segment twice more, the coach’s exhilaration was omnipresent. I believe this Packers offense has the talent, balance and coaching to rule the NFL in 2015 — and set new heights for one of the league’s proudest franchises. Like most great offenses, it starts up front. McCarthy completely agreed with my assessment that this offensive line is the best he’s had since he’s been in Green Bay. Remember when this unit was the weakness of otherwise promising teams? No longer. This is a young, cohesive, talented group — able to protect Aaron Rodgers and blow open holes for Eddie Lacy. McCarthy gushed — collectively and individually — over David Bakhtiari, Josh Sitton, Corey Linsley, T.J. Lang and Bryan Bulaga. The White Wall is perhaps McCarthy’s best OL since taking over. The starting 5 are fantastic left to right, plus the top 2 guys off the bench have starting potential and have experience behind them. Linsley proved to be a great answer at center last year as a rookie. He has talent, smarts and plenty of promise to just continue improving. Re-upping Bulaga this offseason was paramount. This is what Ted Thompson’s Packers do: draft, develop and retain. And this kind of continuity is what makes Green Bay the envy of franchises around the league. In so many past chats with McCarthy, the bulk of our conversation was spent assessing a rag-tag group up front. How will you make sure to protect your all-everything quarterback? Last Thursday was a far cry from that. And this is fine news for Rodgers, the best quarterback in the game today. (This isn’t up for debate.) More good news for Rodgers: His arsenal of weapons is simply glorious. The Packers’ offseason MVP has been second-year wideout Davante Adams, the clear “all-star” according to McCarthy. Davante Adams has shown he has the ability to step up big in the biggest games. He was a key cog in big close wins over New England and over Dallas in the NFC Divisional game. His hands, speed, work in the classroom, versatility and budding rapport with Rodgers put him in line for a breakout sophomore season. We caught glimpses of his immense potential last season (see: seven catches for 117 yards and a touchdown against Dallas in the Divisional Round of the playoffs). Look for Adams to thrive in 2015. And here’s the beauty for Rodgers (and a scary thought for the rest of the league): Adams is clearly the third option in the passing attack. The Packers re-signed Randall Cobb before he officially became a free agent. Cobb could have received more money on the open market, but he’s no fool. Randall Cobb could have gotten millions $ more elsewhere, but he wants to win Super Bowls and there’s no better team than the Packers. It’s hard to leave Lambeau Field. Yes, why leave the best QB in the game? Cobb is a game-breaker that Rodgers looks to on third down and in the red zone. Life is good in Green Bay. And let’s be honest: $10 mil per isn’t exactly chump change. Oh, I haven’t even mentioned Jordy Nelson, the best receiver on the team (and one of the best in the NFL). Nelson has notched 43 touchdowns over the last four seasons, and after setting career highs in catches (98) and receiving yards (1,519) last fall, he received my vote for first-team All-Pro. Perfect playcall. Perfect pass. 16-10 deficit about to be a 17-16 lead with this 90-yard game-changing touchdown. Nelson dropped this. Packers would not score again, and lost the game, and with it, the NFC #1 seed, meaning they had to play Dallas instead of Carolina, and then had to play the Seahawks in Seattle instead of at Lambeau Field. McCarthy says Nelson, who’s recovering from offseason hip surgery, is on target to practice fully come training camp and there are no concerns about his health. 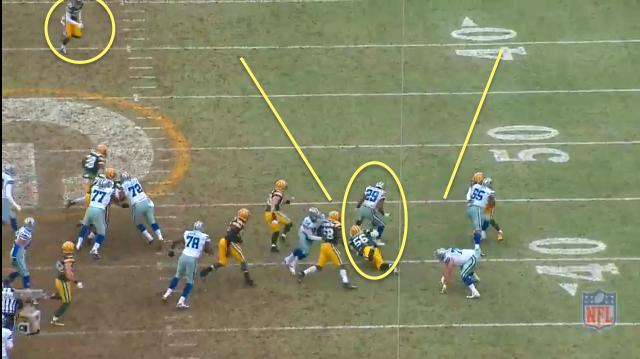 And with Lacy, Rodgers has the bell cow he needs to pound the rock on first and second downs. In the past, you could ignore Green Bay’s running attack. Lacy is a physical, powerful stud who demands defensive attention. With Rodgers, you are always in position to win big. Add in Lacy and the stout O-line, and the Packers become my Super Bowl favorites. McCarthy himself fuels my optimism, too. The offensive guru decided to give up play-calling duties this offseason. I told McCarthy that I disagreed with the move because of how great he is as a play-caller and the connection he has with Rodgers. But McCarthy explained to me that this had been a long time coming — it was not a knee-jerk reaction to what happened in Seattle on Championship Sunday. In fact, McCarthy revealed that he originally planned on ceding play-calling duties to Joe Philbin following the 2011 campaign. While the Packers led the league in scoring that season, McCarthy wanted to be in position to better oversee every element of the team. This plan changed, though, when Philbin took the head-coaching job in Miami. Now, with Tom Clements having spent three years as Green Bay’s offensive coordinator, McCarthy feels comfortable handing over the reins. The head coach is thinking big picture; he’s thinking about winning a title. And this Packers offense should be superior to that 2011 edition, and superior to the 2010 championship group, too. McCarthy is positive — this is the equivalent to a typical person being over the moon. That means Packers fans should dream big. Yes, Lombardi Trophy big. ~Green Bay — Practice concluded, lockers were cleaned out and players broke for summer. There aren’t too many pressing issues with the Green Bay Packers. The offensive starters are essentially set. On defense, the team needs cornerbacks to develop but will be returning mostly unchanged. That’s how a team that came so close to reaching another Super Bowl probably wants it, too — limited change. 1. Davante Adams may be on the verge of breaking out. Quarterback Aaron Rodgers said in a Q&A with The Journal Sentinel that wide receiver Adams “could be a star.” Head coach Mike McCarthy called Adams the “MVP” of the off-season. It’s not mere bluster, either. With Jordy Nelson easing back from off-season hip surgery, Adams was Rodgers’ go-to guy all spring. His route running has always been smooth and sudden. His size (6 foot 1, 215 pounds) is ideal. And athleticism? Replay the 360-degree dunk Adams posted on social media. Now, it appears he’s gaining Rodgers’ trust, mentally, within the offense. It could all equate to a breakout season from the second-year receiver out of Fresno State. 2. At OLB, Adrian Hubbard caught the McCarthy’s eye. Asked who stood out in practice, the coach said Hubbard “has had a heck of a spring.” With Nick Perry and Mike Neal sidelined and 35-year-old Julius Peppers taking it easy, the 2014 undrafted pickup Hubbard has gotten a lot of work at outside linebacker. As he said at rookie camp, Hubbard decided to stay in Wisconsin all off-season. The pads weren’t on in this setting, but he was able to hone his technique. And Hubbard sees the time in town paying off. 3. Rajion Neal has the inside track on the No. 3 running back job. With DuJuan Harris off to the Minnesota Vikings, there may be a roster spot up for grabs behind Eddie Lacy and James Starks. Neal stood out as a receiver. At Tennessee, Neal caught 66 passes for 626 yards and five touchdowns, and he’s clearly been working on his hands since. On Thursday, he had a touchdown during a red-zone drill and another long gain in the 2-minute drill, in addition to multiple difficult catches in one-on-one’s vs. linebackers. Right now, he has a clear step on the other running backs. Undrafted signee John Crockett pulled out of practice this week with an apparent ankle injury. 4. Micah Hyde will have a role in the defense again. 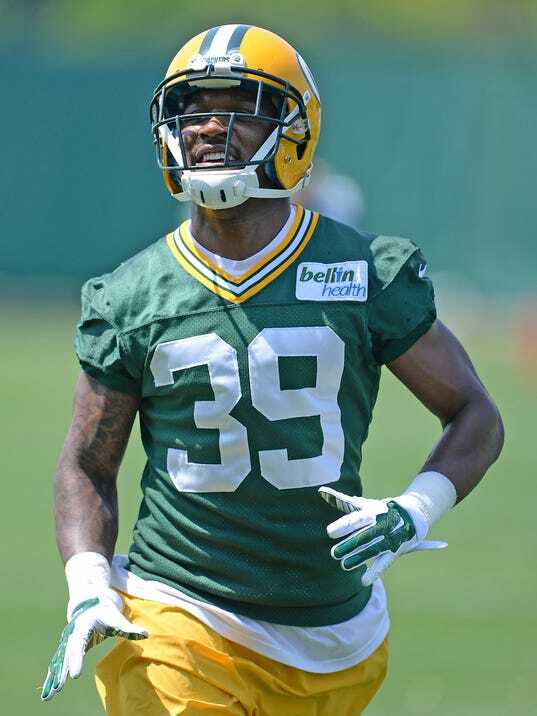 The Packers might’ve drafted two cornerbacks in the first two rounds in Damarious Randall and Quinten Rollins, and Ha Ha Clinton-Dix is now entrenched at safety next to Morgan Burnett but count on the third-year pro Hyde seeing a lot of snaps again. He had 59 tackles and two interceptions last season and has picked up where he left off. Inside the 20-yard line Thursday, Hyde broke on one ball for a pass breakup that should’ve been intercepted by a teammate and then picked off an underthrown Brett Hundley ball in the corner of the end zone. He also averaged 15.8 yards per punt return last season. 5. Yes, Clay Matthews will be seeing snaps at inside linebacker. That much was clear the first day of OTAs in May. The Packers continued to work their best defensive player inside and outside. He slid in for 28.5% of the snaps the last half of the 2014, a number that could grow in 2015. Maybe Jake Ryan, Carl Bradford or someone else develops into a source of reliability, but the Packers want Matthews on the move again in their defense. 6. Don’t expect Aaron Rodgers to confine himself to the pocket. In two straight seasons Rodgers suffered two serious injuries. But the fractured collarbone and strained calf won’t be forcing the league MVP to stay exclusively in the pocket. While he proved he can play that way — burning Detroit and Dallas for 542 yards and five touchdowns — Rodgers made it clear he’ll continue to make plays outside the pocket. 7. Eddie Lacy is looking large. Again. But it probably doesn’t matter. The Packers running back has carried a few extra pounds into OTAs before and still rushed for 2,317 yards and 20 touchdowns. Generously listed at 230 pounds again by the Packers, Lacy said he’s not worried at all about his weight. The Packers probably just hope he doesn’t enjoy his mom’s crawdads too much this next month. 8. The young cornerbacks have a long way to go. Position coach Joe Whitt Jr. feels good about Sam Shields and Casey Hayward, the two cornerbacks who have played a combined 116 games. Everyone else? Not so much. Whitt has been hard on his first- and second-year corners all spring on and off the field. With reporters, he’s been blunt. Randall, Rollins and even 2014 sixth-rounder Demetri Goodson, he insists, aren’t ready yet. “We have a lot of work to do,” Whitt said. 9. Defensive linemen are counting on newfound flexibility. Both B.J. Raji and Datone Jones said they made a commitment to yoga this past year to help their flexibility. Raji believes being too tight might’ve been one reason he tore his bicep tendon, while Jones says his tightness was a major reason he missed at least five sacks in 2014. So with the help of Ryanne Cunningham — who’s not affiliated with the Packers — at Flow Yoga Studio in De Pere, they’ve become more limber. 10. Last year’s finish will be motivation. For all the cliché responses from players on “moving on,” a few players admitted the way last season ended — heartbreaking fashion at CenturyLink Field against Seattle — will serve as motivation this season. How could it not? It was arguably the most crushing loss in franchise history. ~Demetri Goodson doesn’t want to say he was lost. However, the learning curve was steep for the former Gonzaga point guard-turned-Green Bay Packers cornerback once he arrived at last year’s organized team activities. When his position coach Joe Whitt shouted directions, sometimes a small panic would hit the sixth-round draft pick. Goodson had questions but was afraid to raise his hand. He didn’t want to draw attention for the wrong reason, especially when sharing a room with veterans like Tramon Williams and Jarrett Bush, who knew Dom Capers’ defensive playbook inside and out. 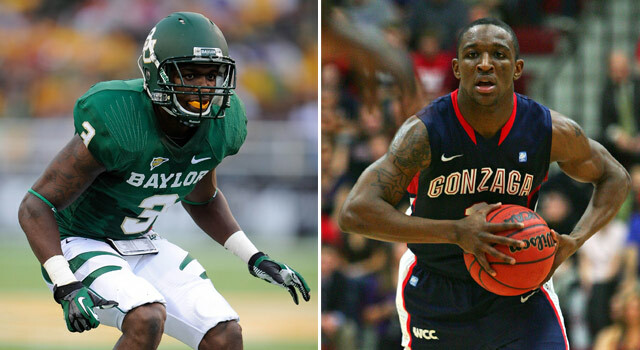 In Goodson and Quinten Rollins, the Packers have the best basketball backcourt in the NFL. And Julius Peppers played hoops at North Carolina for the Tar Heels. Where were these guys on the onside kick recovery? The Packers bet on Goodson’s upside and sent Rolle back to the practice squad (a mistake, as many Packers beat writers said at the time). A few weeks later, Rolle signed with Houston where he finished with 19 tackles and three interceptions in 10 games. Goodson was inactive for all but one game through November. He didn’t play a defensive snap all season, but his athleticism showed on special teams. He finished the year seventh in coverage-team tackles (six) despite playing only six games. When the season was over, Goodson went back to Waco, Texas, to train for his second season. He turns 26 this offseason and knew he’d need to contribute more in 2015. Training with friends and former teammates, Goodson worked on his press technique, tracking deep balls and defending against the slant. Goodson tried to take what he’d learned from Whitt to improve his backpedaling through drills and weaves. He also hit the weights hard. Really hard. They drafted Damarious Randall and Quinten Rollins with their first two picks, but the organization likes bringing rookies along slowly during the offseason program. So it’s been Goodson who’s been lining up on the boundary across from Shields on the first-team defense. Extra reps in the offseason don’t mean you’ve secured a starting job. Two years ago, running back Alex Green started the summer taking snaps ahead of Eddie Lacy. By the end of camp, Green had been released and Lacy was anointed the bell cow. It helps with confidence, though. Goodson isn’t able to press in the noncontact practices, but he’s challenging receivers on routes. Last season, he consistently went against Jordy Nelson on the scout team. Now, it’s time to show what he learned from those experiences. Goodson stops himself when he says he felt lost as a rookie. Instead, he admits to battling confidence issues. After transferring to play football at Baylor in 2011, he had only two full seasons to relearn a position he hadn’t played since high school. The jump to the pros was even more drastic. Who knows. the Packers could have something special in Goodson if he physically toughens up. He has a great combination of height and athletic ability. And as shown on the basketball court at the highest level in college, he clearly has the ball skills needed to become a playmaker. “I feel like when I first got here, I was learning how to play corner. Now, I feel like I’m an actual cornerback,” Goodson said. “Playing cornerback isn’t just going out there and just covering guys. It’s a lot more thinking involved. ~Green Bay — In today’s Journal Sentinel, we explored the lives of players who had the game ripped away from them. The ones with career-ending neck injuries — such as Nick Collins, Terrence Murphy, Johnathan Franklin and Johnny Holland — weren’t able to walk away from the game under their terms. Neck injuries cut their careers short. These days, Franklin is settling in at Notre Dame as the administrator for student welfare and development in the athletics department. 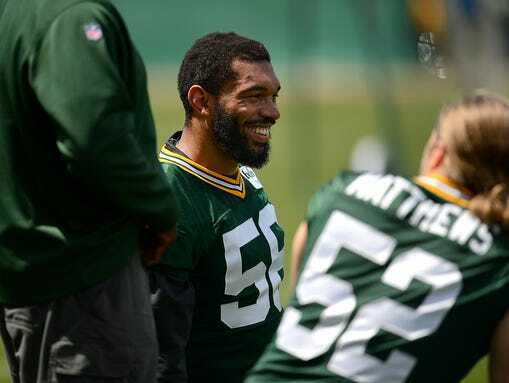 ~Green Bay — A year ago, Julius Peppers was the new guy in town tackling age and expectations in Green Bay. Now, he’ll need to do it again. At 35 years old. “Win. Win,” he said. “That’s it. There’s nothing else to do but to win. Without this play by Peppers to strip DeMarco Murray, the Packers would not have even made it to Seattle. If Clay Matthews is playing inside linebacker many snaps again, the Packers will be counting on Peppers’ pass rush even more. He proved in 2014 he can still disrupt a passing game in the twillight of his career. His size and athleticism still overwhelmed offensive tackles at times. Now, he’ll need to do it again. ~Green Bay — All signs have been pointing to a successful recovery from a torn bicep tendon for Packers nose tackle B.J. 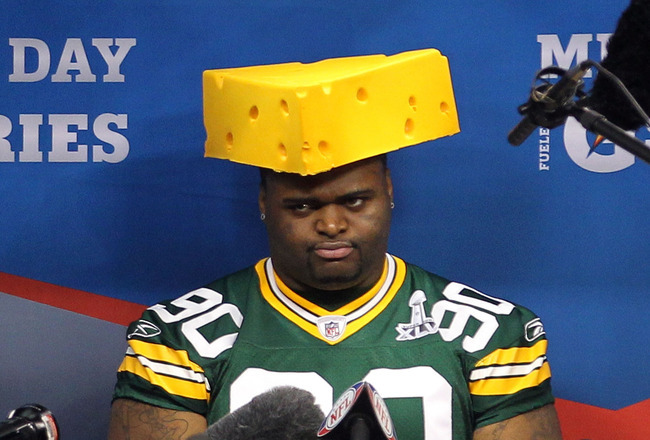 Raji, from weight-room theatrics to his overall mind-set as a free agent. And back in Green Bay for organized team activities, he’s been a full participant. During Thursday’s open OTA session, he took part in individual drills and lined up with the first-team defense. Raji hasn’t been held back at all, saying he’s back at full strength. And quite possibly, Raji is the No. 1 key to Green Bay’s defense, a massive 337-pounder back at his preferred nose tackle position. Rehab was not easy in that he needed to get all muscles along his arm firing in unison. “I am there,” Raji said. “I did some things back home that allowed me to get that confidence going. I worked with my technique coach and we did some things on the field with punching bags. Working with some other NFL guys, my confidence got back quick. Here, it was just making sure my technique and my hands and feet and everything were good. ~Green Bay— No one would blame JC Tretter if he felt robbed. So maybe that’s why there seems to be no one more enthusiastic about practicing in the OTAs this spring than the 24-year old, 6-foot-4, 307-pound Tretter. Not only practicing, but back at center. Tretter thinks he will play mostly there for the rest of these OTAs and for the veteran minicamp later this month. It is the position he feels he’s at his best, and most comfortable. “I think it just fits me,” said Tretter. “I know the offense, I make all the calls. After Tretter was placed on injured reserve last season, the Packers used their “designated return” tag on him so he wouldn’t be out for the entire year. “I would say this injury was tougher than the first one,” said Tretter. “The timing was tough; I was looking into the season, getting going, and then it hits. It definitely took me significantly longer to wrap my mind around it. It took me a week or so to get past it. “Yep, during practice, I was hitting all of them,” said Tretter. This off-season, the two centers, Tretter and Linsley, have worked closely together. They’re friends, sharing the same sarcastic personalities as well as a desire to break down the offense. “I think our entire room has that, which is nice; you can get on people and they don’t take it personally,” said Tretter. “We both know the offense inside and out. If we see something, we have that conversation. What are you looking at, we have this now, what are you thinking? What do you think about that linebacker, he’s a little far backside, what are you going to call? ~The Green Bay Packers in 2014 got exactly the player they thought they were getting when they signed Julius Peppers as a free agent. He was a difference maker, maybe the second-best player on their defense, behind Clay Matthews. Peppers’ sacks total (seven) doesn’t necessarily reflect that, but according to Pro Football Focus, his 50 combined sacks, hits and hurries did. That’s the same number Matthews’ put up as a pass rusher. General manager Ted Thompson saw enough to bring back the 35-year-old Peppers this season for the second year of his three-year contract, and at $9.5 million, which is $1 million more than the Packers paid him last year. Now it’s Peppers’ charge to defy the NFL’s actuarial tables for another year and play at a similar level as in ’14. You can’t know for sure what’s going on in a person’s head, but the Packers have to take it as a good sign that Peppers has no plans to quit football after this season. That suggests he feels good physically and mentally even after 13 NFL seasons. Thompson was willing to count on Peppers for another season because the outside linebacker is among the most gifted athletes the franchise has seen in recent years. His impressive frame is only part of the story — at 6-feet-7 and 287 pounds, he’s huge for a position where 6-4 and 255 pounds is prototypical size. What stands out almost as much, though, is Peppers’ injury history, in that there isn’t much. He’s never had a major injury in his life and has missed only two NFL games because of injury in his 13-year career. That was because of a sprained MCL in 2007. The only other games he missed were the final four of his rookie season for violating the NFL’s substance-abuse policy. That means he’s played in 202 of a possible 208 games. He played through a broken hand with the Carolina Panthers in 2009 and another sprained MCL with the Chicago Bears in 2011. All things considered, that’s remarkably injury-free for such a long career and means his body has weathered professional football far better than an overwhelming majority of players. This was a game-saving, and season-saving, play Peppers made on Demarco Murray in the NFC Divisional Game. Dallas had the momentum and a 4-point lead, heading into Packers territory in the third quarter. Murray may have taken this one to the house without the strip. Only #28 Sean Richardson may have been able to stop him otherwise. In recent years, Peppers has changed the way he trains in the offseason to accommodate his age. He has cut back significantly on the volume of his workouts, though you wouldn’t know it by looking at him. He looks like the same player who joined the Chicago Bears as a 30-year old in 2010, and his listed weight of 287 pounds is only four pounds more than the 283 he weighed at the NFL scouting combine in 2002. Incredibly, he takes a full month off from training after the season, and then later in the offseason commonly takes a week off here and there, based on how he feels. Earlier in his career, he wouldn’t have considered taking off that much time from working out. “That’s what works for me,” he said. Defensive lineman B.J. Raji said that the qualities that stand out after observing Peppers for a little more than a year are his flexibility and diet. He’s never seen Peppers engage in or talk about extra stretching, but when watching Peppers play he sees a naturally limber athlete. Raji also never has talked to Peppers about diet but has noticed that Peppers’ two or three meals each day at the team’s facility are always healthy. One reason for the Packers to think Peppers can have the kind of impact he had last season is that while it’s unusual for a 35-year-old to still be a good pass rusher, it’s far from unprecedented. Using Peppers’ seven sacks last season as the benchmark, since the NFL started tracking sacks in the 1982 season, a player 35 or older has had at least that many 33 times. Peppers also made a huge play on Romo in the game. Peppers earned every dollar. He’s still a special player. The most was Trace Armstrong’s 161/2 in 2000, when he was 35, followed by Reggie White’s 16 with the Packers in 1998, when he was 37. Players 35 or older broke double digits in sacks 15 times, including three in multiple seasons: Chris Doleman and Kevin Greene did it three times each, and Bruce Smith twice. Peppers doesn’t need a double-digit sack season to be worth the $9.5 million. But he needs to play like last season, when he made enough plays and put on enough pressure to be considered a disruptive player. The Packers also probably need to cut back a little on his playing time — his 73.9 percent of defensive snaps in 2014 probably needs to drop into the 60s this season to improve the odds he’ll be healthy and sharp in January. The bet here is, the Packers will get their money’s worth.